Machinist, Toolmaker and Fabricator in Sultan, Wa. Count on quality. It is front and center, always. Replacement parts for flying aircraft and rolling tanks. Cannon restoration and blank shells. Cannon reconstruction (after import destruction) for displays and for firing blanks. Display stands for aesthetic presentation. Extensively with radial engine parts and service tools. Resoration of rare or obsolete radial engine parts. Quality parts for experimental aircraft. Quick turn around machining for maintenance repairs. Reverse engineering obsolete machine components and updating to modern performance levels. Shafting manufacture and repair or modifications. Boring, sleeving, threading, all that fun lathe work. Tool development and manufacture, drill jigs and fixtures. Fine fabrication, an art unto itself. Designed and fabricated a successful Top Fuel Harley from the ground up. Inventor of the 5" belt drive that is now the standard in nitro racing. Professionally trained in CATIA V5 Design Software. "It's all just squares and circles." -One of my favorite quotes from an early mentor, a toolmaker named Al Hanson. 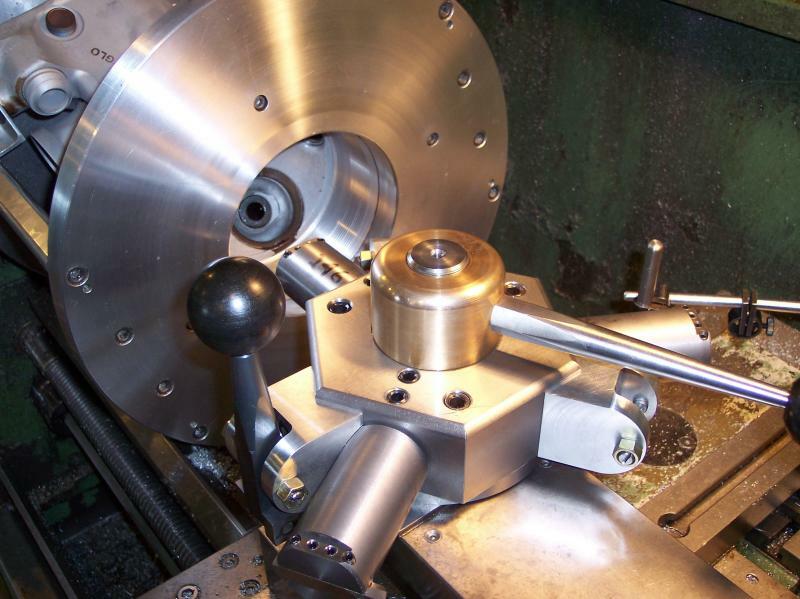 Most toolmaking and machining can be understood as working with three axis, (X, Y and Z). "Squares and circles", and a little basic math. The top picture is of a cylindrical Master Square used to calibrate an angle plate. Pictured above: a three station tool turret for threading aircraft cylinders, custom built for my Nardini 17" lathe. This setup took a bit of development before I was satisfied that it was smooth and precise. It is a real time saver now, on a job I have continually run since 1991. Pictured below: fixture for repairing Propeller Shafts on the Pratt & Whitney R-2800 Radial Engine. This tool does two operations; one horizontal and one vertical. The job is to sleeve the pinion bearing races. An example of restoration work on very rare engine parts. Copyright 2018 Jim Flower LLC. All rights reserved.